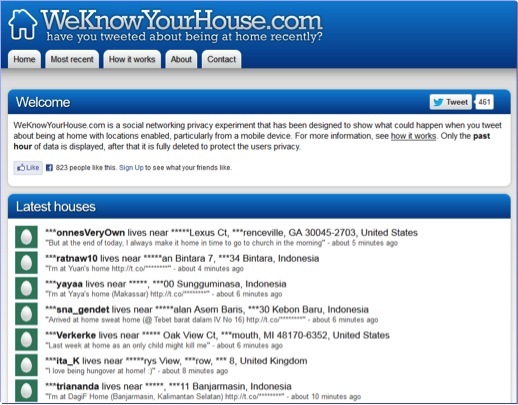 Here’s a cool/creepy thing to keep in mind … when you post to social media or take photos with your phone, it is entirely possible that your laptop or mobile device is also adding location data to your work. This could be a very useful feature if where you are adds context to your posting, such as where you were when you took that awesome shot of the sunset over the ocean (which ocean? which beach? what season?) or if you just tweeted about a great slice of pizza others may want to know where so they can get one too. On the other hand, if you weren’t aware that this information was being captured and made available for all to see, you might not think it was such a great idea. For instance, you could be passing time in a doctor’s waiting room tweeting about last night’s game and not realize that you’ve just told the world that you have a medical problem of a somewhat sensitive nature. As you can see our subject is quite the world traveler but he spends most of his time on the West Coast. 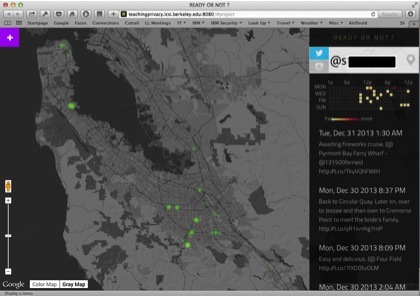 Zooming in on the red “hot spot” from the previous image shows that he is probably based in Silicon Valley. 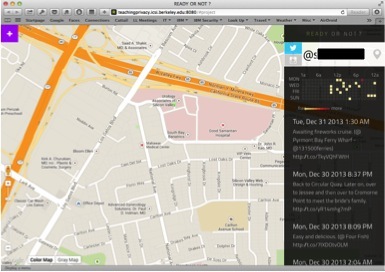 Zooming in further still shows a Google map with one of the tweets coming from a urologist’s office. Maybe he was just there to work on their computers but, still, it’s probably not what he had in mind to blast out to the Twitterverse when he wrote that tweet. What is the most secure OS?